About 7.4 million people received federally administered payments in December 2007. The average monthly payment in December 2007 was $468. Total payments for the year were more than $41 billion, including about $4 billion in federally administered state supplementation. The majority were female (56 percent). Fifteen percent were under age 18, 57 percent were aged 18 to 64, and 27 percent were aged 65 or older. Most (83 percent) were eligible on the basis of a disability. Almost 5 out of 10 recipients under the age of 65 were diagnosed with a mental disorder. Despite their disabilities, about 357,000 recipients (5.7 percent) were working in December 2007. Effective with this year, the reports Children Receiving SSI and SSI Disabled Recipients Who Work are being discontinued. Tables from those reports are now included in this report. 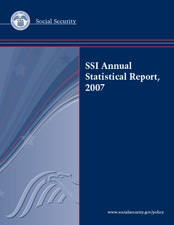 Clark D. Pickett managed the preparation of this report. Alfreda Brooks, Stella Coleman, Art Kahn, Judi Papas, and Clark Pickett prepared the statistical tables and narratives. Staff of the Division of Information Resources edited the report and prepared the print and electronic versions for publication. Due to the inclusion of tables formerly in the reports Children Receiving SSI and SSI Disabled Recipients Who Work, all tables previously numbered 16 or higher have been renumbered. The table entitled "Recipients terminated, by age and reason for termination" was not produced this year. For consistency of data presentation across tables, the category "Unknown" has been added to data groupings in several tables.